it’s summer time in the city! sorry i’ve been away so long. it was such a busy spring now, all of a sudden, it’s summer! charleston in the summer…it’s a love/hate relationship for me (but mostly love!) on the one hand, there’s the beach, the parks, the wonderful summer evenings, and chilly cocktails of course! but there’s also the heat and the mosquitoes, yuck! so recently i took a trip to new york city which is, next to charleston, my favorite place in the whole wide world. i love the sights and the sounds. i love the way it makes you feel alive! i wish i could have stayed longer. i was lucky enough to see wicked on broadway and (just a plug!) if you’re ever in the city, do yourself a favor, go see it! you won’t regret it. it was beyond amazing. you’ll be singing all the way home. so on the tails of my fabulous trip to the city – i’ve been wondering how you could bring that “big city” decor into your lowcountry wedding. a lot of brides like charleston because of its history and it’s old-world charm. but, it’s also a city, rich with its own culture, and that’s something to celebrate too! these images are new york-inspired and absolutely adorable! and imagine them with a lowcountry touch! a cake with rainbow row and the charleston bridge? too precious!! and even morris island lighthouse? it would be so memorable. the creative confectioners at ashley bakery would be the perfect ones to make it! and the last picture! again, imagine it charleston-inspired! on broad street with the old exchange at your backs? on market street, the people bustling all around you? this may not be a big city, but you can find it hidden if you try! finally, i love this idea. quick! trivia question! if you had to choose new york’s accent color, what would it be? tick tock! did you guess? it’s …. yellow of course! bring yellow into your reception as a nod to the taxi. and leave in your very own pedicab. new york’s got ’em and so does charleston! this photo is courtesy of brian dorsey photography in new york. isn’t it just adorable!? 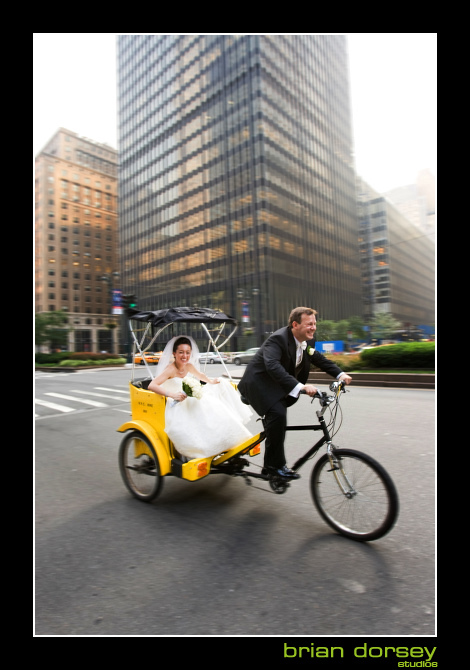 make your arrival and departure in a city chic pedicab – and it’s environmentally friendly too! so my lovely brides – whether you’re throwing a rustic southern affair or a chic and sophisticated city wedding, charleston’s got it all! and elle courtney events has the talent to make it happen.